The crowd at the Girls Day Out meet at Rosehill Gardens in Sydney. A little touch of magic has come to Rosehill as the spring racing carnival draws to a close in Sydney. 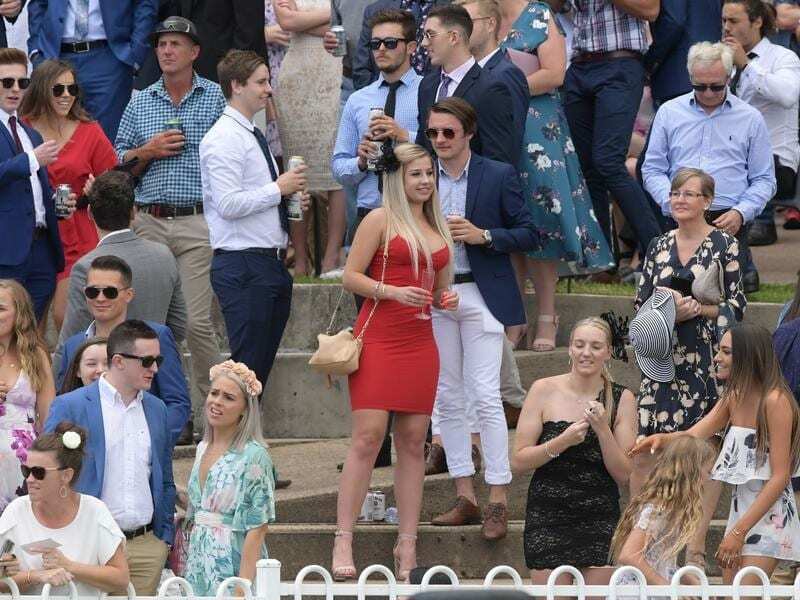 Magician and DJ, Apollo Jackson, who has predicted Melbourne Cup winners two years running, entertained the 12,000 strong-crowd at Saturday’s race meet as fashion took centre stage for Ladies Day. A photo with the former reality TV bachelor was part of the prize for best spring racing look. Winner Sophie Schultz, 27, in a high-necked Zimmerman polka dot dress with velvet Gucci mules and brocade Prada bag, said it was her first time at Rosehill. “I’m so surprised to win. I’m just here to have a day out with my friends, I didn’t even know it was on,” Ms Shultz told AAP. “Most of the time I’m in tracksuit and slippers,” the new mum said. The other part of her prize, a $2000 spending spree at Westfield, she will split with friends. Racegoers were also given free make-up touchups, including false eyelashes, while their floral prints, bright fitted dresses and slimline pantsuits were brought to life in delicate sketches by Alexandrea Nea and Stephanie Baynie. The fashion illustrators, whose creations have appeared in designer campaigns and magazines, enjoy the challenge of drawing the theatrical outfits. “I think the personality in dressing comes out a bit more, it tends to be a bit more flamboyant, especially with fashions on the field,” Ms Nea, a former fashion designer who made her own skirt for the day, told AAP. Over-the-top millinery and exaggerated silhouettes let the pair show off their creativity. “I guess it goes crazy and we like to put that on paper,” Ms Baynie said. After being hugged by selfie-taking fans Mr Jackson ended the afternoon’s entertainment with a brief DJ set. “I think it’s less about the races and more about the atmosphere and bringing everyone together in one place,” the performer said.